ReText is a new, simplistic text editor for MarkDown syntax that supports some popular formats such as PDF, ODT, HTML and plain text. Unfortunately you can only export to these file formats (so you can't use it to open a PDF or ODT file but it does work for HTML) but even so, ReText is quite a handy application. 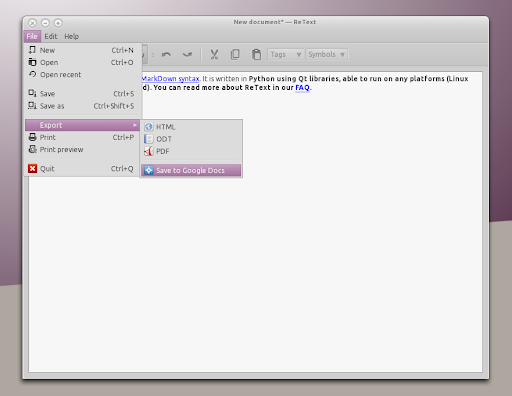 Further more, ReText lets you export your documents to Google Docs. For now, each export creates a new document because "Document replacing API is available in gdata3, which is in Labs for now", says the ReText developer. If you're not using Ubuntu, you can grab the ReText source @ Sourceforge. Thanks to Dmitry for the tip!